Introducing exciting new coloring books for children who love all things creative. This is a brilliant new range of coloring books, with a page stuffed full of great stickers for curious kids. Bursting with imaginative outlines for children to shade, these coloring books will keep little ones entertained for hours. The sticker page at the front can be used either in the book or anywhere else. Bold outlines will inspire children to be creative and improve their motor skills. 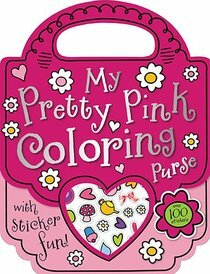 About "My Pretty Pink Coloring Purse"
Gabrielle Mercer is a graphic designer who lives in Hertfordshire, England with her husband, Brendyn, and son, Judah. As a Christian, she especially enjoys working on books that make faith exciting for children and young people today. Unavailable. This item is being reprinted. There will be a delay in fulfillment of your order.